It comes too late for many, but Harris County Commissioners Court has tightened up flood plain development regulations in an effort to prevent new homes being built in the 500-year flood plain from future flooding. The county action came only days after a Clear Lake forum on flooding, led by the Houston flood czar, Stephen Costello, and a group of experts who felt something needed to be done in the wake of the thousands of homes and cars that flooded during Hurricane Harvey. 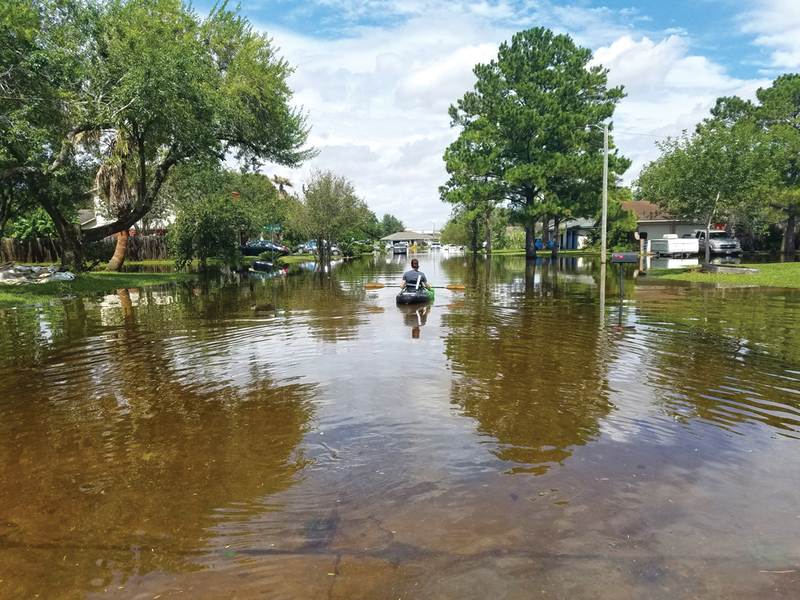 The Clear Lake flood forum featured a diverse group of experts and thought leaders exchanging ideas on how to solve both the flooding problem and the need for a coastal spine to protect the area from storm surge during hurricanes. Best news of the night at the public forum at NASA’s Gilruth Center came as Clear Lake City Water Authority President John Branch described how its Exploration Green project saved hundreds of Clear Lake City homes from flooding, although it is only 88 percent complete. The Clear Lake area, downhill from Houston and Pasadena, has eight 100-year flood plains and four 500-year flood plains, he said. And, he proudly told the audience, “It worked as designed, filling up with 100 million gallons of stormwater” that could have gone into nearby homes. Exploration Green was formed and incorporated to develop, preserve and protect the land that was once known as the Clear Lake Golf Course. The land was purchased by the Clear Lake City Water Authority for use as both a storm water detention pond and a recreation area. The Water Authority created a Master Plan for the area and sponsored the formation of a Conservancy to generate funding for the installation, operation and maintenance of the amenities outlined in the plan, such as hike, bike and pedestrian commuter trails, athletic fields, lakes, water features and abundant natural habitat and native grass land areas. The second part of the evening was devoted to the proposed coastal barrier system, which would provide a gate across the mouth of Galveston Bay and a barrier system along the coast, to prevent storm surge damage during hurricanes, but which still lacks financial help from the government nine years after Hurricane Ike’s devastation. Col. Len Waterworth from Texas A&M-Galveston showed a film illustrating how a direct hit by a Category 5 hurricane could wreak havoc across Southeast Texas and how various cities and officials are working to get the money to build the system. Jim Blackburn of Rice University, Brandt Mannchen of the Sierra Club and Bob Stokes of the Galveston Bay Foundation told of their efforts to keep an eye on the turtles, birds, fish and wildlife in Galveston Bay and the Gulf of Mexico. Dr. George Guillen, director of the UHCL Environmental Institute hosted the event and Dr. Neal Lane of the Baker Institute at Rice served as moderator.